(Nanowerk News) A heat-sensing camera designed at Arizona State University has provided data to create the most detailed global map yet made of Martian surface properties. The map uses data from the Thermal Emission Imaging System (THEMIS), a nine-band visual and infrared camera on NASA’s Mars Odyssey orbiter. A version of the map optimized for scientific researchers is available at the U.S. Geological Survey (USGS). The new Mars map was developed by the Geological Survey's Robin Fergason at the USGS Astrogeology Science Center in Flagstaff, Arizona, in collaboration with researchers at ASU's Mars Space Flight Facility. The work reflects the close ties between space exploration efforts at Arizona universities and the U.S. Geological Survey. "We used more than 20,000 THEMIS nighttime temperature images to generate the highest resolution surface property map of Mars ever created," says Fergason, who earned her doctorate at ASU in 2006. "Now these data are freely available to researchers and the public alike." Surface properties tell geologists about the physical nature of a planet or moon's surface. Is a particular area coated with dust, and if so, how thick is it likely to be? Where are the outcrops of bedrock? How loose are the sediments that fill this crater or that valley? A map of surface properties lets scientists begin to answer questions such as these. The new map uses nighttime temperature images to derive the "thermal inertia" for areas of Mars, each the size of a football field. Thermal inertia is a calculated value that represents how fast a surface heats up and cools off. As day and night alternate on Mars, loose, fine-grain materials such as sand and dust change temperature quickly and thus have low values of thermal inertia. Bedrock represents the other end of the thermal inertia range: because it cools off slowly at night and warms up slowly by day, it has a high thermal inertia. "Darker areas in the map are cooler at night, have a lower thermal inertia and likely contain fine particles, such as dust, silt or fine sand," Ferguson says. The brighter regions are warmer, she explains, and have surfaces with higher thermal inertia. These consist perhaps of coarser sand, surface crusts, rock fragments, bedrock or combinations of these materials. "A tremendous amount of effort has gone into this great global product, which will serve engineers, scientists and the public for many years to come," Christensen says. "This map provides data not previously available, and it will enable regional and global studies of surface properties. I'm eager to use it to discover new insights into the recent surface history of Mars." As Fergason notes, the map has an important practical side. "NASA used THEMIS images to find safe landing sites for the Mars Exploration Rovers in 2004, and for Curiosity, the Mars Science Laboratory rover, in 2012," she says. 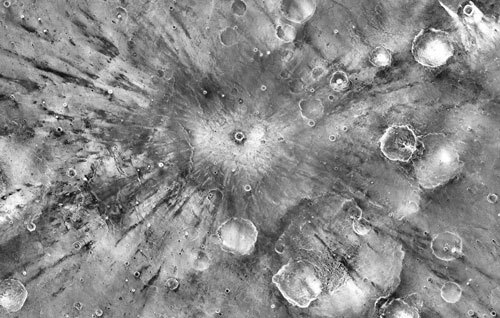 "THEMIS images are now helping NASA select a landing site for its next Mars rover in 2020."